Bauer alumna Lisa Kuhfeldt (’07) and her husband Brian Lewis (’00) are serving up southern favorites in the form of barbecue and sides with their new business near campus, Oak Leaf Smokehouse. Lisa Kuhfeldt (’07) was never hog wild about barbecue. It was either “too smoky or too fatty or too rich,” says the graduate of the C. T. Bauer College of Business at the University of Houston. When she married ’cue connoisseur Brian Lewis (’00), she might have become a barbecue widow had her husband not won her over with fire and passion. Indeed, the first few years of their marriage were hot and sizzling — charry, charry nights filled with the scent of his home-smoked pork butts, ribs and brisket. In 2012, the pair of UH grads (he has a degree in political science, she a BBA in finance from Bauer) discovered that Pete’s BBQ in Houston’s Eastwood neighborhood was for sale and decided to buy it. 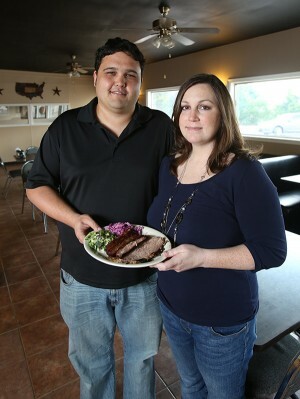 In February, their culinary hobby became a business with the opening of Oak Leaf Smokehouse on Telephone Road. Now customers are finding Lewis’ succulent meats and Kuhfeldt’s delectable sides to be a heavenly match. As Lewis honed his barbecue chops, Kuhfeldt stirred her interest in sides. She felt that barbecue joints too often give their sides the short shrift, serving mushy potato salad, boring baked beans and sauce-slogged cole slaw. To complement Lewis’ Carolina pulled pork, Texas brisket, smoked chicken and sausage, she concocts Hot German Potato Salad, Corn Pudding, Purple Apple Cole Slaw and other thoughtful fixings. “I have a finance degree, so I am going to be doing all the bookkeeping and the payroll, all the accounting,” she said. From 1994-1996, Lewis attended Cornell University, where he played football and studied engineering. He later transferred to UH, studying at the Conrad N. Hilton College of Hotel and Restaurant Management before switching to political science. As the King of the Smoker and the Queen of All Sides, Lewis and Kuhfeldt’s entrepreneurial enthusiasm never flamed out. But their restaurant concept took a second to simmer. The couple decided they didn’t want kitsch, and they didn’t want mom and pop, either. Eventually, they settled on Oak Leaf Smokehouse, a reference to the oak wood they use for smoking meats. So far, Oak Leaf has received nice coverage from Houston Eater.Com, HoustonPress and Culture Map Houston. After initially serving lunch only, it recently expanded its hours to 8 p.m. And there’s good news for hungry UH family — in the form discounts to students, staff and faculty. Maybe you’ll find you have a hankering for the smoked “baked” potato, stuffed with meat, or the messy nachos with queso, brisket and jalapenos. Lewis sure made a ’cue lover out of Kuhfeldt. That’s great, and in my neighborhood. I’ll be stopping by soon. Congratulations, Lisa and Brian! I’ve had Brian’s ‘cue on multiple occasions. He knows his ‘cue. My favorite thing he makes is BBQ hot wings. I’m not sure is he does it at Oak Leaf, but if he does, I strongly recommend them. Congrats, my friends!